UPDATE: Marty Kotis, a self-described supporter of the No Restaurant Tax campaign, said that the group's website "does not endorse any candidate; it just informs of candidates' positions on an important issue. Therefore it is not electioneering advocacy." Kotis said in a Facebook message that mayoral candidate Robbie Perkins "addressed a group that included numerous elected officials at the Grandover and discussed the prepared foods tax" in June 2010. Kotis said he confronted Perkins on the issue, and Perkins responded, "Well, how else would you suggest we pay for it?" Related: The No Restaurant Tax Facebook page indicates that at-large candidate Marikay Abuzuaiter is now formally opposed to the prepared foods tax. ORIGINAL POST: Guilford County Deputy Elections Director Charlie Collicutt said he has referred the No Restaurant Tax campaign to the NC Board of Elections for possible investigation. The online materials have been amplified by Facebook and Twitter, and campaign signs have popped up on commercial properties that lease to restaurants, including in front of Mahi’s Seafood Restaurant, a business owned and operated by Abuzuaiter. She does not own the real property. Marty Kotis -- who owns a Darryl’s Wood Fire Grill franchise on High Point Road and who is the president of Kotis Properties, a commercial real estate firm with a focus on developing and leasing to restaurants -- has identified himself as a supporter of the campaign, while declining to elaborate on whether he has played a more significant role. Kotis Properties ranked number one as an employer of contributors to city council candidates in the last election cycle, according to a study conducted by YES! Weekly. Collicutt said he called the NC Board of Elections after the matter was brought to his attention by District 3 city council candidate Jay Ovittore. The county board of election does not have the authority or capacity to investigate on its own. Ovittore declined to complete the TREBIC questionnaire and is listed as “unknown” on the campaign website. Kotis could not be reached for comment for this story. Collicutt said a possible outcome of a board of elections investigation is that the people behind the No Restaurant Tax campaign would be required to register as a political action committee and file periodic disclosure statements about contributions and expenditures, just as a candidate does. The term “political committee” means a combination of two or more individuals, such as any person, committee, association, organization, or other entity that makes or accepts anything of value to make, contributions or expenditures and has one or more of the following characteristics… has the major purpose to support or oppose the nomination or election of one or more clearly identified candidates. Guidance on the law can also be found in the 2010 Campaign Finance Manual, a copy of which is available on the NC Board of Elections website. The relevant passage is on page 71. Collicutt said the state law is somewhat open to interpretation considering that the language on purpose is fairly specific. The guidelines would apply to a group of two or more people that endorsed candidates, but Collicutt said it’s possible that the language on the chart would not meet that criteria. 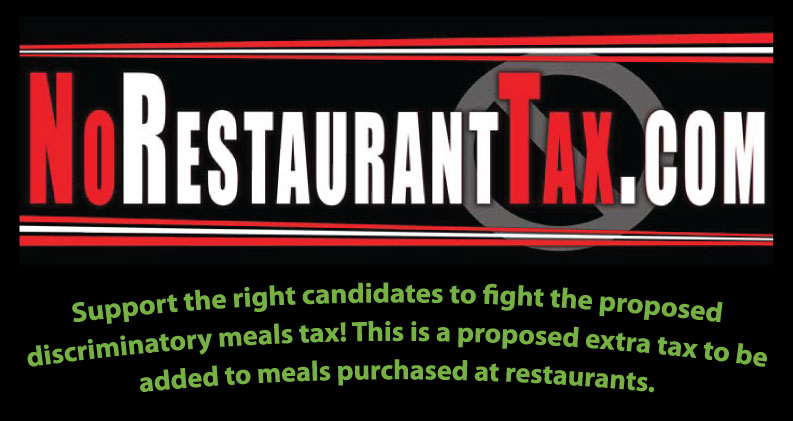 The determination likely hinges on whether the phrases “good for restaurants” and “wants to tax restaurants” meet the definition of having the purpose of supporting or opposing the nomination or election of candidates. "Just to be on the safe side, I would encourage anyone putting out any kind of election material to form a PAC," Collicutt said, adding that the nuance of election law makes it easy for people to unknowingly cross the line, and that registering would allow a group to make endorsements without fear of violating the law. Trida,i think it wont be.. PAC wont allow..
Triad Watch, if the campaign were being financed by the state restaurant association, wouldn't the materials have to state that? I confess I haven't researched this part of election law. But it seems to me that the spirit of the law is to encourage disclosure any time money is transacted in activities whose purpose is to effect the outcome of an election.